The beaches in the west Calvados and southeast Cotentin still keep the memory of the Second World War. At the seaside you can find also pleasant places for family holidays. Between the Orne river and Courseulles-sur-Mer, the “Côte de Nacre” offers long sandy beaches lined by beach huts. Towards the Cotentin coastline rises to form cliffs, as in Arromanches. The south east of Cotentin offers a coastline of marshes, dunes and beaches of fine sand. 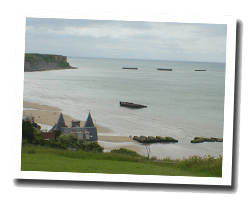 On the D-Day Landing Beaches, enjoy a seaview holiday rental. with free WiFi, Résidence La Plage d'Or offers pet-friendly accommodation in Vierville-sur-Mer. 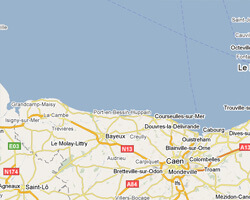 Caen is 44 km away. All units have a living room. There is also a kitchen with dishwasher, oven and coffee machine. Finnish real home FINN HUS 1946 (classified in the General Inventory of Cultural Heritage French) completely renovated in 2014. Facing the beach of the landing of June 6, 1944 Omaha Beach. Price from 1240 € to 1480 €. facing the sea in St Aubin sur Mer . Beautiful Belle Epoque villa located on the promenade Favreau, direct access to the beach , close to parking and shops. More information on our website www.villalaloggia.fr. 1 Bedroom(s), 1 double bed(s). short stays possibility. Final cleaning : 25 €. Price from 580 € to 980 €. House 4 roomss 75m2. Close to the beach. balcony. Pets allowed. In Bernières, Studio Apartment in a residence quiet and secure. Balcony. Distance to the sea: 50 m. View of the sea and the beach. 3 rooms Apartment 56 m2 on the 3rd floor. View of the sea and the port. 2 Bedroom(s), 1 double bed(s). short stays possibility. Final cleaning : 50 €. Cottage 4 roomss 100m2. Close to town centre. 2 Bedroom(s), short stays possibility. Final cleaning : included. House 5 rooms 100m2. terrace, balcony with barbecue. 3 Bedroom(s), short stays possibility. Final cleaning : included.